Do the cruise during the Summer months if you can, you'll be able to enjoy the sun set over London. We are comparing London Showboat Dinner Cruise on River Thames Prices from leading ticket suppliers and Try to find you Cheap tickets prices on the market. A night of food, wine, and entertainment as you cruise down the River Thames on the London Show Boat. Passing by some of London's most iconic sights, beautifully lit up at night, the boat travels down to the Thames River Barrier before making the journey back again to Westminster Pier. Though the menu is subject to change, you'll be dining on dishes such as smoked salmon mousse, king prawns, salad, soup, roast chicken or vegetable lasagne, finished off with a chocolate cake, after dinner mints and tea/coffee. A romantic evening for couples. A superb way to spend an evening in London, especially if you're celebrating an anniversary, birthday, or simply celebrating that you're in London! Great if you're looking to meet other travelers and make new friends as you'll be sitting with other diners on long tables. Your Experience With London Showboat Dinner Cruise on River Thames? Departing at 7.45pm, you will cruise down the River Thames on a glamorous 3 hour dinner cruise on the The London Showboat. You'll be welcomed aboard with a glass of sparkling wine in the lounge saloon before being escorted to your table where your 4 course meal will commence. Enjoy the view of some of London's most iconic sights lit up at night passing the window as you tuck into your pre-selected meal with a bottle of white wine or red wine shared between two. You'll be passing the Houses of Parliament and Big Ben, cruising under Tower Bridge, pass the O2 center, and more. Relax and take in the live entertainment with West End show tunes, both old time favourite's and current hits, you're sure to be tapping your toes to some of the tunes and singing along! After dinner there's more entertainment as you enjoy another glass of wine or a tea or coffee before being invited up on the dance floor to dance the night away before getting back to Westminster Pier at approximately 11pm. What London Showboat Dinner Cruise on River Thames Includes? Be sure to book a window table if you want to admire the best views of London at night from the Thames. Travelers Reviews about London Showboat Dinner Cruise on River Thames? Travellers talking about this river cruise on Get Your Guide, Viator, and Trip Advisor give it mostly 'Excellent' and 'Very Good' ratings. They say that the food is delicious and plentiful and the evening entertainment and over all vibe excellent with the servers working hard throughout the night to keep everyone happy. 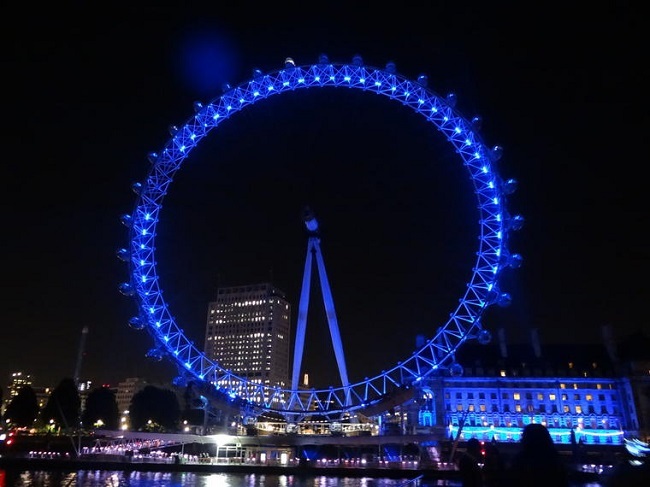 People have described it as "An amazing way to see the sights" and "THE way to see London at night"
They also say "The food exceeded my expectations", "I would definitely recommend it" but others do note "Whilst good, the London cruise is not of the same standard as Paris or Sydney". E-tickets and paper tickets are accepted on board. Notify the staff at time of booking if you have any specific dietary requirements / allergies etc. Gluten free and/or vegetarian meals must be pre-ordered, minimum 24 hour notice.